limited edition - only 100 copies were produced in celebration of the 2006 Sonoma County Book Festival. English only. The book will be autographed if purchased through the website. Click here for information on how to buy this book. At the Edge of the River (Al Lado del Rio) is a mixed collection of prose and poetry printed by Running Wolf Press. This book is printed in Spanish and English. Click here for information on where to find this book. In Out Of My Heart (De Mi Corazon) Topics wander from philosophical musings to lamentations, verses to the seasons, and even anger with The Almighty. First published by Thumbprint Press in October 1999, the third edition was released December 2002. The book is printed in Spanish and English. Click here for information on where to find this book. 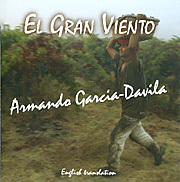 Armando's latest CD is an English translation of his popular "El Gran Viento" CD, which follows the experiences of Mexican people who crossed the border into the United States, legally or sneaking across. 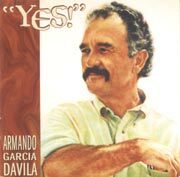 In 2002 Armando released his first CD: YES! Thirteen tracks of his love poetry set to the music played by jazz saxophonist Michael Bolivar. All in English, each track is read by the poet together with a host of others. Their voices and moods reflect each piece. Click here for information on where to find this CD.